A Stoke Newington newsagent was ordered by Hackney Council to remove festive decorations from his shop on the day the Olympic Torch relay passed by. 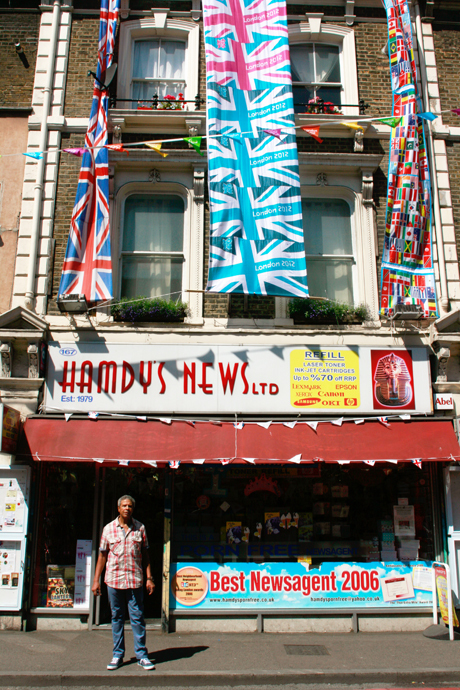 Hamdy Shahein, a well-known community figure, had decorated his shop, Hamdy’s Newsagent, with balloons, banners and bunting for the occasion. On Saturday morning, however, Mr Shahein was visited at his Stoke Newington High Road premises by enforcement officers from Hackney Council. They questioned him as to whether the decorations were official Olympic merchandise, and then demanded that he remove them. Mr Shahein objected to what he saw as the heavy-handed approach towards the offending items. “I was shocked because I was making an effort to do something nice for the community,” Mr Shahein explained. A crowd of loyal Hamdy’s customers remonstrated with the council officials, arguing in the newsagent’s defence. Mr Shahein recounts how not long after the council officials left, a van full of police officers arrived at his shop to confront him. He told the Hackney Citizen he was so upset by the incident that he considered shutting up his shop for the day and going home. Local solicitor Kristin Heimark believes Mr Shahein was ill-treated: “Hamdy is one of the lynchpins of our community. He likes to get in the spirit of things. “I don’t know if people realized when the Olympics laws were passed that it would mean this, and that we would have people from trading standards coming round requiring bunting to be removed,” she commented. Trading Standards officers have the power to enforce under the Trade Marks Act 1994 and the Olympic Symbol Etc (Protection) Act 1995. London mayor Boris Johnson has warned of the “insanity” of heavy-handed policing of Olympic brands whilst Michael Payne, a former marketing director at the International Olympic Committee, has said such action risks damaging the Games.